M-F 10:00 a.m. to 6 p.m.
Our diagnostics equipment and software will allow us to detect any problems in your system. After the diagnostics if you choose us to do the repair work the diagnostics is FREE! Upfront pricing on all our services! NO hidden fees or costs. All our prices are down to earth so we have nothing to hide. 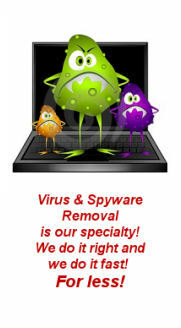 Complete Virus & Spyware Removal ONLY $39! Includes free Anti Virus and Spyware software. All our work is guaranteed! © 2005-2014 DAVANS COMPUTER SERVICES. ALL RIGHTS RESERVED.